Small businesses feeling under financial strain can cut the cost of their promotional budget with a great value Exhibition Bundle deal from PrintDesigns. With a range of banner packages available, businesses can harness the marketing power of great quality pop up displays, exhibition stands, printed graphics, literature stands and more, whilst saving up to £100. Keeping costs low is a priority for organisations of any size, and a well-planned budget can help to keep control of business expenditures and ensure that profits are made, without loss. Yet, for small businesses in Britain this need for financial savings is more important now than ever. A survey by ‘business for sale’ website Bizdaq revealed that 370,000 small business owners in the UK were seeking to close down operations in the next five years, as government strain and economical difficulties put pressure on the fight for survival. Small business owners can invest in their marketing efforts wisely with a bundle deal of promotional materials from PrintDesigns, to raise their profile and increase profits without the worry of a large price tag. Mark Thompson, Co-Founder of Printdesigns said, “As a company that has been supporting the nations businesses for over 15 years we are sorry to hear news of struggles of small business owners. Embarking upon increased marketing efforts at this time is important, to create profit and to remain stable, yet many organisations may be left at a crossroads when considering the further costs this may create. We created our bundle deals as a one-stop marketing solution, providing the most effective promotional materials at a reduced cost than what would be achieved when buying each item separately”. 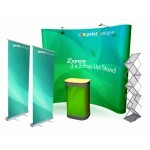 The Exhibition Display Bundle Deal is a great package containing everything needed to increase visibility at any public event. Included is a 3×3 express pop up stand, wheeled case with a folding table top and a printed wrap around panel, 5 panels of printed graphics for pop up display stands, halogen floodlights, 2 roller banner stands and a folding literature dispenser. All items within the bundle can be printed with company branding and advertisement graphics for a high quality marketing solution with impeccable impact. Organisations can also take advantage of the new range of innovative TEXStyle fabric banner stands with the TEXStyle Fabric Rectangle Bundle and the TEXStyle Fabric Oval Bundle at only £550 each.